Fuzzy Thoughts: don't look if you're related to me! hey, don't berate yourself-- that eeyore is amazing. as are your trees and farm animals, but the eeyore is pretty perfect. really. is the tail really a pin-on? 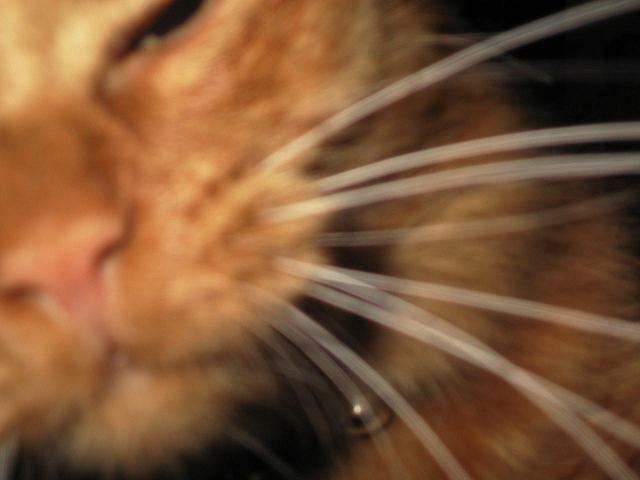 December 12, 2007 at 8:57 p.m. I think it looks like eeyore! you have done a great job. December 12, 2007 at 9:13 p.m.
December 13, 2007 at 4:17 a.m. The tail has a hole at the top, and the pin is really a bobble knit in black. My niece is only a couple months old, so I didn't want to use a button. December 13, 2007 at 6:52 a.m.
Hey! 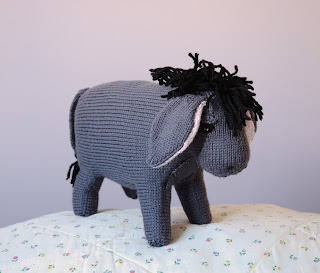 What pattern is your eeyore inspired by? He's perfect! Oh... and I like the two trees on the right side of the photo, especially the beaded one. Sweet! December 13, 2007 at 7:28 a.m. 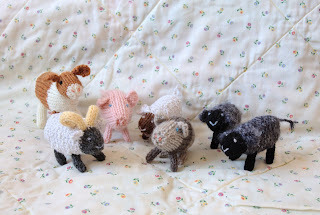 The donkey pattern is in a book called "Toy Knits" by Debbie Bliss. There's lots of other cool toys in it too, like a camel and a kangaroo. December 13, 2007 at 7:39 a.m.
Love those itty bitty farminals...the ram is so cute. I think you did a lovely job on eeyore! 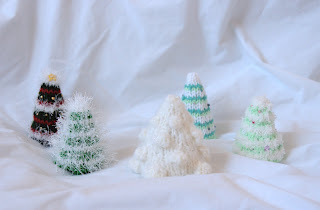 I can't wait to get home tonight and start some of those wee trees-so cute. Thanks ever so much. December 13, 2007 at 8:07 a.m.
December 29, 2007 at 4:11 a.m.